Yotaphone 2 expected price in India is ₹15,999. It's not often you come across a truly unique device in the smartphone market, but the Yotaphone 2 is exactly that. Unique. From the front it looks like any other Android smartphone, but flip it over and you're greeted with a second, all-touch display - only it's an E-Ink screen similar to those found on ereaders. The Yotaphone 2 is the Russian brand's second entry into the market following on from the original, proof of concept, Yotaphone which launched in 2013 and aimed squarely at early adopters. The original YotaPhone was an interesting concept, but it was poorly executed. With this second generation, many of its issues have been addressed. The e-ink display is higher quality, the design has been greatly improved and it has generally better specs all round. It's a considerably more refined product. 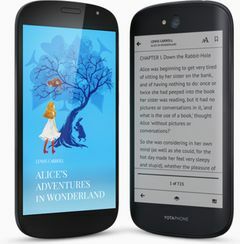 The YotaPhone 2's rear e-ink display lets you read e-books for long periods without draining much battery. A feature no other phone has. It has decent all-round specs and a good front screen too. Its high price puts it among the top-end phones, which it fails to justify. The e-ink screen suffers from ghosting issues, the software for customising it isn't particularly easy to use.